Order “A Better Weigh to Healthy” Cookbook! This thick, yummy, berry sauce is delicious and compliments pancakes or waffles so well. It only takes minutes to make and is a delicious way to add protein to your meal. The Fluffy Sourdough Pancakes are just not complete without it! 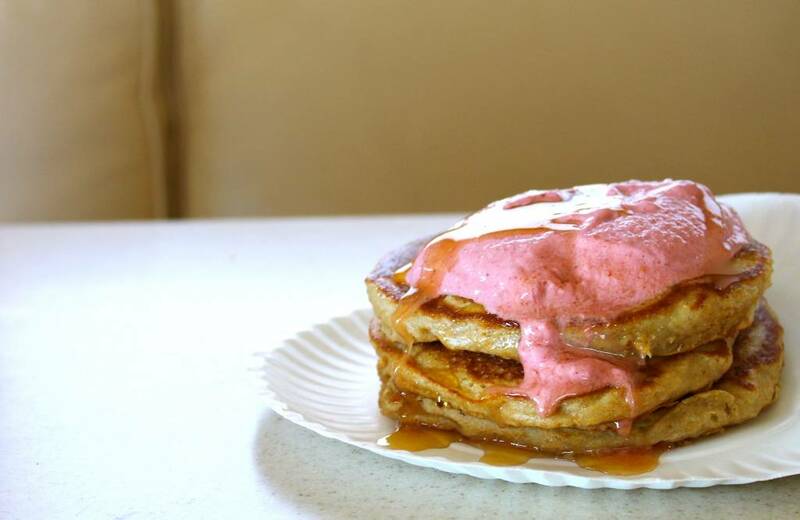 Pictured above: Fluffy Sourdough Pancakes with the Strawberry Cashew Sauce and THM approved syrup. In a high-powered blender, blend everything except the strawberries for about a minute. Add the strawberries and blend berries are blended. Eat immediately--before it melts! Maybe you’ve posted it before, but wondering if I could have your recipe for your homemade truvia?